Drew Lane and his mother, Linda, disputed an insurance bill. 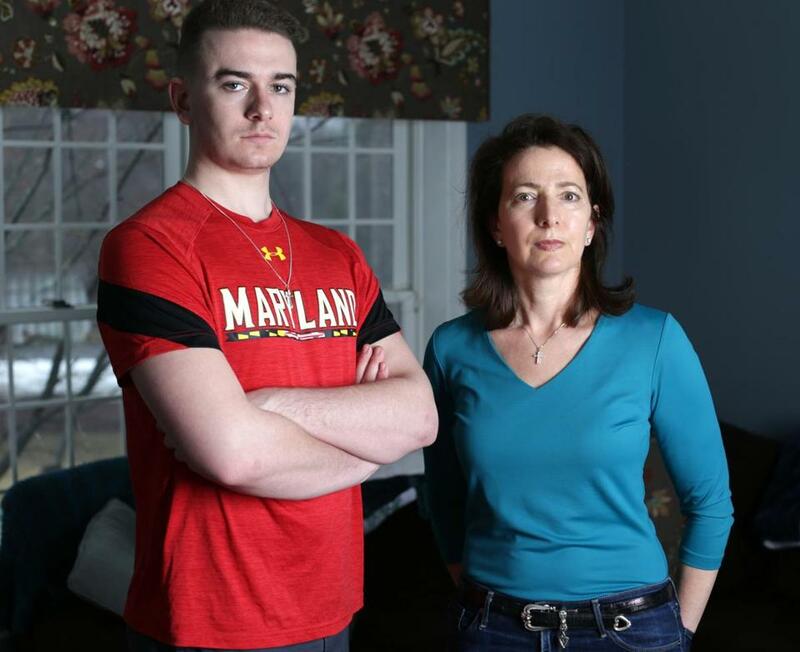 Linda Lane had a lot on her mind when she arrived at MetroWest Medical Center with her 19-year-old son to have his swollen tonsils removed. At 6 foot 4 inches, Drew is a sturdy lad. But eight months earlier, as a college freshman, he had been knocked off his feet by a nasty bout of both mononucleosis and pneumonia. On Jan. 3, Lane did her best to steel her nerves as Drew was prepared for surgery that, while usually uncomplicated, is not without risk. Then MetroWest gave Lane something new to worry about: The hospital wouldn’t take her insurance. For the next several months, Lane was caught in the middle of a nightmarish experience with the hospital and her family’s medical insurer, CIGNA. Through it all, Lane remained undeterred. And at one point, she did something absolutely brilliant as a consumer: She asked for and received a copy of the hospital’s case notes. “I call it my smoking gun,” she said, passing me a single page at her home in Hopkinton. That one page may have saved her more than $12,000. Last spring, after her son got sick, Lane asked CIGNA for a list of ear, nose, and throat specialists in the insurer’s network. She knew the drill: In network, she had generous insurance coverage; out of network, she had none. Lane booked an appointment with Dr. Yushan Wilson, who examined Drew and determined she would have to take out his tonsils. Lane asked for — and got — assurances from Wilson’s office that the surgery on Jan. 3 at MetroWest, where Wilson practiced, would be covered by her insurance. “They said, ‘You’re all set,’ ” Lane said. But on Jan. 2, Lane received a disconcerting call from an administrator in the “authorizations” department at the Framingham hospital. “You’re out of network,” she said. Lane called Wilson’s office in a near-panic. 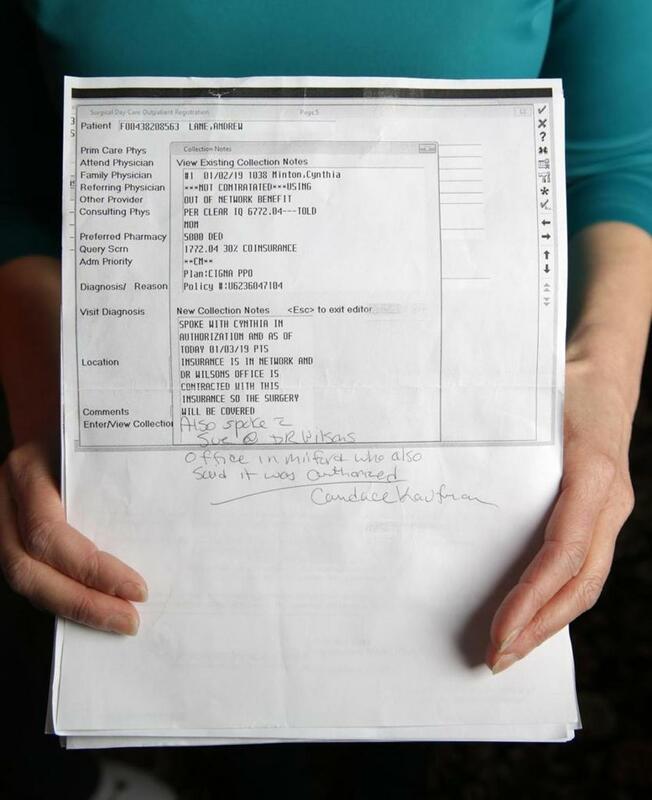 Linda Lane with a screenshot of the memo written by the MetroWest Medical Center administrator. Lane next called CIGNA. While she was on the phone with CIGNA, Wilson’s office called back: They had checked with MetroWest, and in fact she was covered. A relieved Lane shared her “good news” with the CIGNA representative, who wondered aloud why MetroWest wasn’t on her list of in-network hospitals. Maybe it’s under a different corporate name, the CIGNA rep said. The CIGNA rep volunteered to call Wilson’s office to double check. The rep implied she would call Lane back if there was a problem. There was no call back. As Lane arrived at MetroWest on Jan. 3, an administrator beckoned her. “We have to set up a payment plan,” she said. For a $100 copay? Lane asked. “You’re out-of-network,” the administrator said. Lane had come prepared with names and numbers. She asked the administrator to check with her colleague in “authorizations,” the one Lane had spoken with the day before. She was prepared to cancel the surgery. After a conversation between the two hospital administrators, Lane was told she was indeed covered. “Can I have a copy of that?” she asked politely, looking over the administrator’s shoulder at the notes on the screen. The administrator looked perplexed. But, yes, she said, you can. She printed it, added a hand-written note, and signed it. An exasperated Lane called MetroWest and reached an administrator who expressed surprise that CIGNA had rejected the claim because the hospital listed Drew’s surgery as in-network. She promised to submit the claim again. 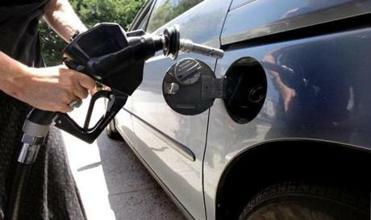 Within days, however, Lane received a bill from MetroWest for $12,076. Lane got back on the phone with CIGNA. And the run-around began again. Turns out that the first CIGNA rep — remember the one who was going to call Wilson’s office to check whether MetroWest was listed under another corporate name? — had determined the surgery wouldn’t be covered but had not called Lane back to share the news with her. She had instead asked Wilson’s office to call Lane with the bad news. That filled Lane with anger. First, the CIGNA rep should have called her back directly, instead of delegating it to Wilson’s office. And second, Wilson’s office apparently didn’t get the message or didn’t understand it because it confirmed coverage on the morning of the surgery — Lane’s “smoking gun” says so. The folks at the MetroWest at first were sympathetic to Lane’s plight, but later took on a clipped, just-the-facts tone. She would have to pay the $12,000. Then they stopped returning Lane’s calls. At times, Lane said, she felt like screaming. I made my first call on Lane’s behalf to MetroWest earlier this month. Within two hours, Lane received a call for the first time from a high-ranking manager at the hospital. Two days later, MetroWest apologized to Lane and ripped up the bill. CIGNA also later apologized. I know my intervention played a role, but credit goes to Lane. She persisted. Of course, none of this should have happened. The health care system is complex and sometimes baffling. Watch out for yourself. How, exactly? Do like Lane did: Document everything.